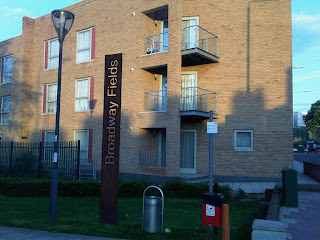 The return of the sun and long days means that Broadway Fields has come in to its own again. A giant asphalt sun trap next to the Seager Distillery, the tall buildings that form its perimeter catch the light like a Canaletto (something our useless photographic skills have failed to do justice to here). Originally opened in 1932 as Deptford Municipal Playing Fields, it was redeveloped by Lewisham Council last decade as part of its strategy for improving the public spaces along the route of the Ravensbourne (see also neighbouring Brookmill Park and Ladywell Fields). Crisscrossed with basketball cages and elevated train lines, it's like a little piece of LA in SE8. When the sun's out it draws kids from miles around to skate, preen and play until the last rays have dipped below the horizon. Thanks to some successful urban design, it's become the playground of choice for the area's teenagers. 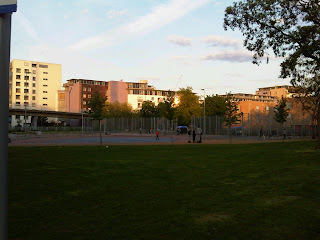 Basket ball, kids, skateboarding, lewisham council involvement, DEPTFORD. sounds like its specifically designed to give Lou an aneurism. Looks like a good honest area to me. Well done them. Not a deli in sight. Basket ball Monkeyboy? Surely basket-ball or bounce-netball? The playground area is great. My daughter loves to roller-skate on the flat area, and it's always busy. Comparing the monstrosity that is the Silkworks estate with a Canelleto does the developer too many favours. It is one of the most depressing collection of new buildings I can think of - like we have learnt nothing about building in the city. I know of at least three people who have been mugged just before little bridge to DLR. One mother had her two small children with her. Take care particularly near the bridge.